World of Confusion Koko Digital Ltd. (United Kingdom), Confused.com (United Kingdom), 2010 Play it Now ! This advergame for a bank challenges you to take control of a pencil where you draw bridges, ramps and barriers to successfully navigate your characters to the end of each level as fast as possible. 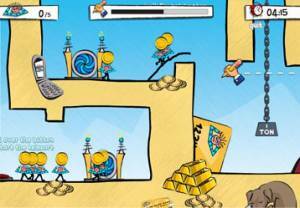 The game features elements that need to be avoided including nasty spikes, heavy weights, and fire hazards. Helpful items include teleport stations, oscillating fans and safety zones.